The Twin Bridges School Board had a big agenda on April 17, as Superintendent Chad Johnson said over 50 people were in attendance. Johnson said a portion of the agenda was spent talking about teacher and staff negotiations, class schedules and the upcoming summer season projects. Ennis High School reported the results from the District Music Festival, held in Bozeman on April 12-14. 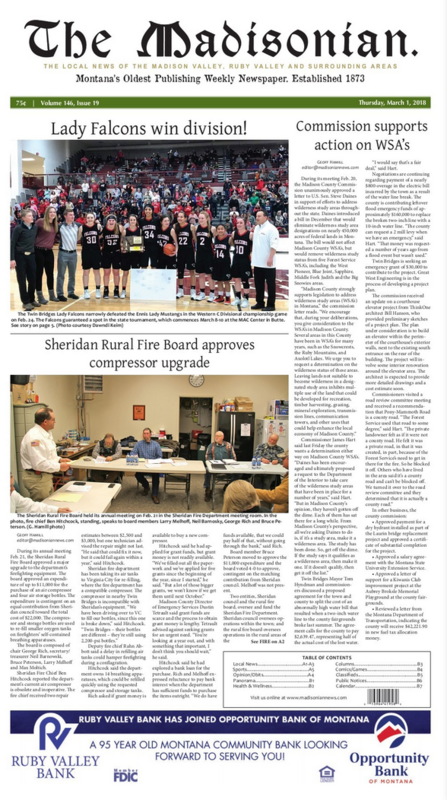 The Harrison School Board met on April 9 and heard from Whitehall wrestling coach Mark Nelson about the possibility of a high school team co-op. While no decision about pursuing a co-op was made, the board asked activities director Connie Young to gauge student interest via a survey for grades 7-12. Read more about Wrestling a possibility for Harrison School? Brighton Dedman is the Ennis Schools Student of the Week! Brighton, whose parents are Dennis and Heather Dedman, is a 3rd grade student at Ennis Elementary. Brighton was nominated for this week’s award for her many excellent qualities. April 4-7, 2018, the Ruby Valley FFA Chapter sent 16 kids to compete at State Convention in Billings Montana. They competed in 7 different competitions consisting of, Parliamentary Procedure, Farm Business Management (FBM), Livestock Evaluation, Sales, Mechanics, Agronomy, and Creed Speaking.